I love brie. I think it’s one of those cheese that I indulge in whenever I get the chance. I bought a round when it was on sale a couple weeks ago and it’s been sitting in my fridge waiting to be used. I finally decided on making a brown sugar apple baked version. I also have puffed pastry just waiting to be used, so it was the perfect combination! 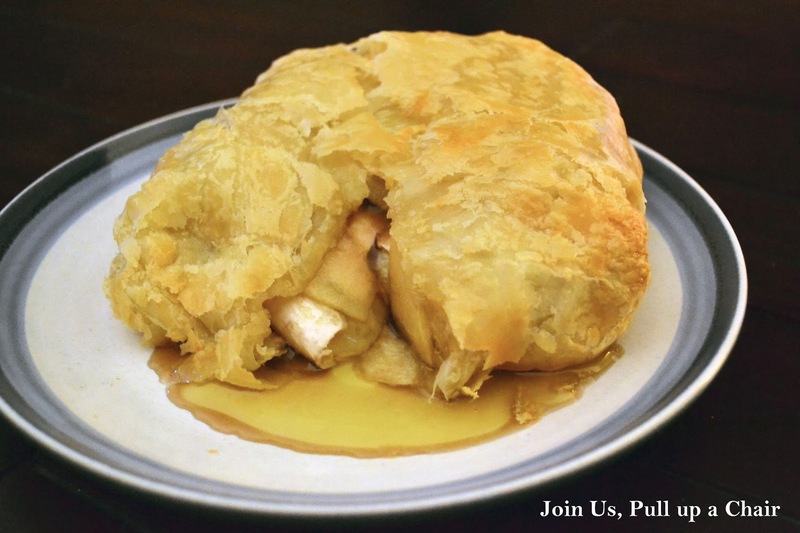 My husband and I both loved it and I enjoyed the combination of the apples, brown sugar, melted brie and the crust. MMM…so good! Preheat oven to 400 degrees. Unroll the puff pastry and lay the brie down on the pastry and press down slightly to form a circle where the brie was. Remove the brie and layer the apple slices around and inside the circle. Top with brown sugar and then the brie. Wrap the puff pastry around the mixture and lay seam side down on a baking sheet. In a small bowl, whisk together the egg and water. Brush over the top of the puff pastry. Bake for 20 minutes until golden brown. Let rest for 10 to 15 minutes before cutting into the brie. Serve with crackers and sliced apples.